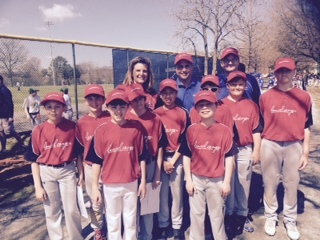 April 11, 2015 – Pioneer Roofing’s bats stayed hot for the second straight game as they again scored four runs in the first inning, leading to a 7-3 victory over Eugene Simpson on Saturday after the official Alexandria Little League Opening Day ceremonies. After the Simpson starter walked the first two Pioneer batters, back-to-back triples by Jack Kelly and Ben Wilson and an RBI double by Pierce Yao put your Pioneers up 4-0 before an out was recorded. Wilson, who earned the win as the starting pitcher, struck out the side in the first two innings to hold Simpson in check. Yao led the offense with two hits and three RBI, including a two-run blast over the centerfield fence in the third inning that extended the Pioneer lead to 6-1. Wilson allowed one unearned run in his three innings of work, striking out eight, walking three, and giving up one hit. Pitching in relief, Matthew Mineta gave up 3 hits and a run while walking one batter and recording two Ks over two innings. Kelly finished the game, allowing a hit and a run before recording a strikeout to end the game. Injury Report: Catcher Shane Tucker left the game in the third inning after a foul tip hit his right shoulder. X-rays were negative, however, and he is currently listed as day-to-day.